It took Trump only seven months to surpass the number of civilian deaths in foreign nations that occurred during Obama’s entire eight-year presidency, according to non-profit monitoring group Airwars. During the 2016 election, Donald Trump – quite successfully – managed to convince a sizable portion of the electorate that he would take a much more anti-interventionist stance, in terms of U.S. military entanglements abroad, than would his contender Hillary Clinton. Yet, throughout his first year as president, such differences have been few and far between. 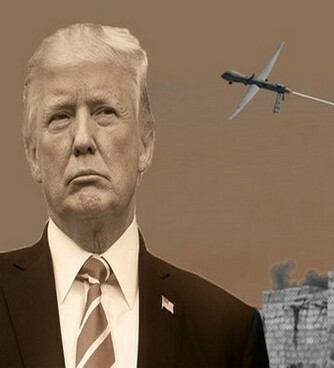 In particular, it has been Trump’s dangerous expansion of the drone war that has authoritatively destroyed any illusion that Trump would genuinely put “America first” — and put an end to dangerous military operations abroad that only serve to exacerbate the horrendously bungled War on Terror. For instance, after gutting the already lax regulations on drone strikes and giving the CIA free rein to kill whomever they choose, it took Trump only seven months to surpass the number of civilian deaths that occurred during Obama’s entire eight-year presidency, according to non-profit monitoring group Airwars. The covert drone war program, first created under George W. Bush, was a key part of the War on Terror whereby terror suspects could be targeted and killed covertly. However, under his presidency, only 57 strikes were conducted in Pakistan, Somalia and Yemen, with between 384 and 807 civilians killed. The program was greatly expanded during the Obama administration, which conducted 563 strikes in those same countries. Now, under Trump, drone strikes targeting these countries have skyrocketed. In 2017, the U.S. bombed Yemen 127 times alone, compared to 32 strikes conducted in 2016. In Pakistan and Somalia, the number of strikes have also increased under Trump. In Somalia, for instance, 34 drone strikes were conducted last year, the same number as all U.S. drone strikes conducted in Somalia from 2001 to 2016. As the number of drone strikes has grown, so too has the number of civilian casualties. Trump’s drone assassination rate is now eight times that of Obama. Obama’s, in turn, was 10 times that of Bush, making Trump’s drone kill rate a whopping 80 times higher than that of Bush. In other words, Trump is on track to be a record-breaking war criminal. However, the problem is bigger than just the innocent lives claimed as a result of the “covert” drone war. Civilian deaths resulting from U.S. airstrikes in Iraq, Libya and Syria reached between 3,923 to 6,102 last year under Trump. This startling figure marks a massive increase from civilian deaths reported during the Obama administration, which was responsible for between 2,298 to 3,398 civilian deaths during Obama’s eight years in office. More troubling than the sheer number of strikes conducted is the fact that U.S. drone strikes kill far more civilians than supposed militants. Indeed, militant leaders on the controversial U.S. “kill list” account for a mere 2 percent of drone-related deaths, with strikes confirmed to kill civilians 90 percent of the time. Shockingly, more than 80 percent of those killed have never even been identified and the CIA’s own documents have shown that they are not even aware of who they are killing — avoiding the issue of reporting civilian deaths simply by naming all those in the strike zone as enemy combatants. The jump in the number of drone strikes and civilian deaths is largely owing to Trump’s decision last March that allowed the CIA to conduct strikes without White House approval. This policy change overhauled the Obama administration requirement that the military would carry out strikes the CIA had identified. Not only has this led to an increase in reported drone strikes, it has also made reporting drone strikes – and their casualties – more difficult, as the CIA, unlike the Pentagon, is not required to disclose the strikes it conducts. Thus, the harrowing figures of civilian deaths incurred under the Trump-led drone war are likely a fraction of the actual total. Trump’s dramatic reversal, played out over the first year of his presidency, is not very surprising given that his “anti-war” credentials touted on the campaign trail were falsified. For instance, Trump claimed to have opposed both the invasion of Iraq – resulting in over a million dead – and the invasion of Libya, which has resulted in a failed state now plagued by slavery and terrorism. In fact, however, he supported both of these disastrous invasions, even supporting the deployment of U.S. ground troops in Libya to remove Muammar Gaddafi from power. The ruse of Trump’s anti-interventionism was painted in disappearing ink along his campaign trail, giving way to a presidency that has no qualms about leaving thousands of innocent civilians dead in its wake.